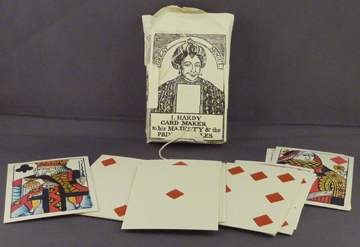 These cards are the classic playing card that surfaces regularly in museum exhibits. The cards are plain card stock without any coating as is put on modern cards so they are authentic for packing in a pocket or other handy place. The cards themselves have nothing printed on their backs and the fronts contain only the appropriate number of the suit symbols and, for the face cards, images for the card values. There are no numbers or letters to indicate the value of the individual cards. We have heard that the reason the cards didn't have numbers or letters was because a lot of the people at that time couldn't read but could count. However, we would question the accuracy of such a statement since the literacy rates in many states would be better than today's (See the article on "literacy" in Virginia's Veranda articles). It is probably a "fact" that has gotten started like the oft heard statement "sleep tight" referring to tightening the ropes of a rope spring, the existence of Underground Railroad quilts containing coded messages, or the use of brick tea. We haven't heard of documentation for any of the latter but they makes great stories so the "facts" continue.